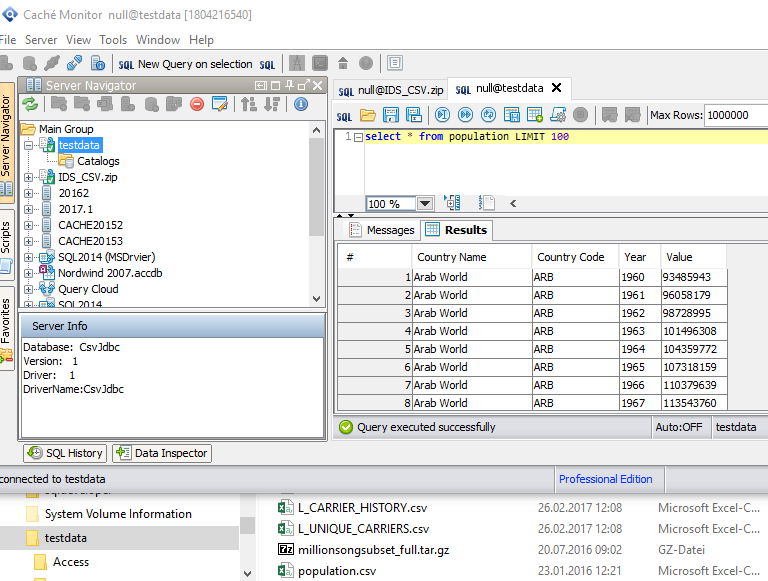 With a “CSV Text connection” you can list, view and analyse your text files like SQL tables. Via Menu “File” -> “Create CSV Text connection” you can create this connection type in Server Manager and query the CSV Files like a simple tables. This is done with the CsvDriver. The SQL Syntax is limited by the driver and is executed localy. You can’t use the Caché SQL Syntax cause it is not Caché you’re using. CsvJdbc accepts all types of CSV files defined by RFC 4180. CsvJdbc accepts only SQL SELECT queries from a single table and does not support INSERT, UPDATE, DELETE or CREATE statements. SQL sub-queries are permitted but joins between tables in SQL SELECT queries are not yet supported. You can pick up a ZIP file that contains multible csv text files. Using folder with many csv files without importing! 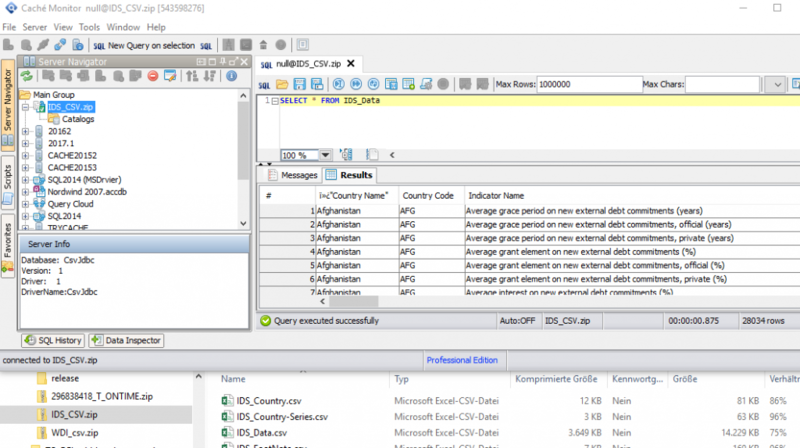 You can just select a Folder for a CSV Connection and automatically query all *.csv files within this folder via SQL. Please see the next Screenshot for details. The CSV Connection is created for a folder called “testdata” within this folder exists a file called “population.csv”. Just write “select * from population LIMIT 100” to get the first 100 rows of this file.